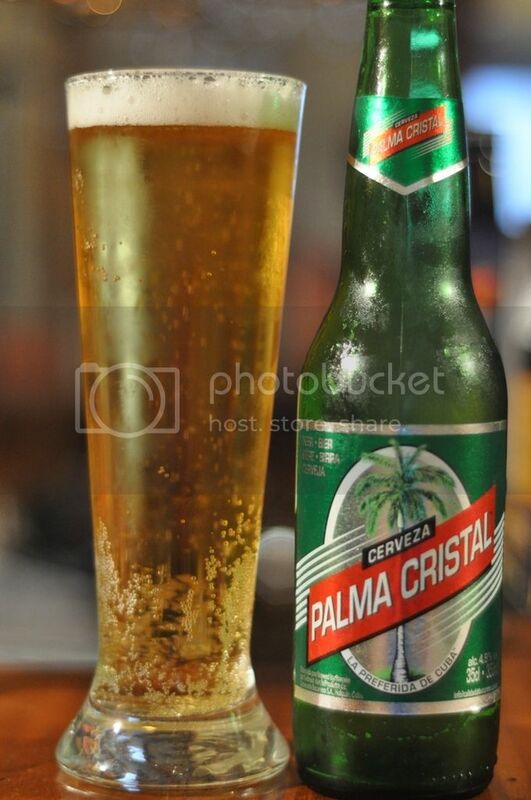 Cerveza Palma Cristal is one produced by the InBev owned Bucanero brewery, Cuba's largest brewery. While this is not the most popular beer on the island, it is the beer with the best reputation around the world. The beer bottle looks really good as well. Cuba is definitely known more for it's cigars that it's beers. Havana cigars are known worldwide for their quality, whilst the beer market on the island is slowly catching up. The island is developing a reputation for easy drinking lagers which suit the hot climate, hopefully this beer is one of the reason for this growing reputation. This beer smells very much like most tropical lagers, in that there is almost no odour whatsoever! As the beer warms up a little I get hints of grains and some sweet corn, I imagine this is one of the adjuncts used in this beer. There aren't many hop notes on the nose, but this isn't necessarily a bad thing. The fact that this beer doesn't really smell means it isn't offensive on the nose, it may not get points for it's aroma but it certainly doesn't lose any. For what this beer is supposed to be it's quite good. By that I mean that this beer isn't about flavour as much as it's about the crispness and refreshment it provides. This lager is light on flavour, except for some grain and very mild hops. However it is clean and crisp, with a light mouthfeel that makes it very drinkable. The lack of any real hops bitterness is a tad disappointing but it's a really good drinking beer! This would make an excellent session beer! The flavours aren't bad, which for a tropical lager is a big plus. Palma Cristal is not a world class lager by any means, but it is perfect for the hot tropical heat of Cuba. If you can find this beer it wouldn't be the worst beer to find for summer. Treat it like any cheap lager, keep it really cold and you will be happy with it. I can understand your review, its well expressed from your point of view. There are few thing that you have missed, the beer is brewed with top-quality malt and crystal clear Cuban water using German technology, Cristal has a light aromatic hop taste that refreshes and revitalizes. It is brewed since 1928 and represent the Cuban liveliness and spirit.